Plumeria Cottage steps from the beach! 2 Bedroom Single Family Beach View Cottage across the street from semi-private North Shore sandy beach. Recently renovated, fresh and breezy, you will enjoy a unique blend of exquisite detail, spacious comfort and quiet ambiance. Gated for privacy, the large grassy yard is adorned with a mature plumeria tree, spectacular bird of paradise blossoms and many other tropical plants. 42' flat screen TV (cable). Comfortably sleeps 4. PV solar panels, ceiling fans, and low flow toilets were installed to conserve energy. See the most famous surf breaks in the world, including Pipeline, Sunset and Waimea Bay. Shopping and Restaurants within minutes in Historic Haleiwa Surf Town. As beach access is steps away, snorkel, boogie board or kayak with the sea turtles just across the street. Your sun soaked vacation in paradise awaits you! Need a bit more space? Please feel free to look at our other family-owned and managed property, VRBO listing 567915. We moved to Oahu on a whim over ten years ago, and now have built our life here with a growing family to boot! The North Shore is magical, as many have found, and this is our way of sharing it. We live and breathe this gorgeous place, and are always happy to give suggestions on our favorite spots to make your stay even more special. For many visitors, Hawaii is a once in a lifetime vacation, and this is a constant reminder just how lucky we are to live here! Such a wonderful little house, only minutes from the ocean. 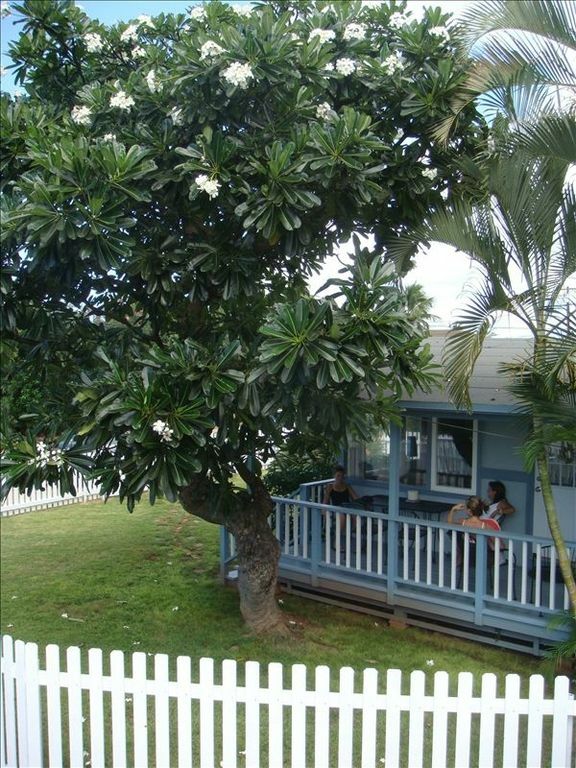 Easy access to Haleiwa and all other North Shore beaches. The house was clean, comfortable, and as advertised. This is my third time staying at this cottage while working on the North Shore. Very quiet and convenient location. Close to beaches and towns. Plan on returning end of 2019. Wonderful place to stay away from the hustle and bustle of Honolulu. 3 minute walk to the beach, 5-10 minute car ride into Haleiwa. Beach cruiser bikes came in handy - though they could use a little work - they are quite rusted from the ocean air, but they did the trick. Boogie boards and beach chairs were available for use - we took them with us a few times, but never actually used them. Quite a bit of snorkel gear to chose from - some in the carport area, some in the closet inside, however, we brought our own. Furniture inside the cottage was very comfortable but it would have been nice to have one more chair in the living room so that 4 people could sit comfortably without having to squeeze 3 people on the couch. But that's minor. We made it work and really didn't spend much time inside anyway. As people have mentioned there is no A/C. I was afraid that might be a problem, but it really wasn't. The first day we got there the cottage had been closed up and was quite warm, but we opened windows and turned fans on and it cooled off enough to sleep. While we locked up the doors everyday when we left, we left all the windows open the whole time we were there which really made a big difference. The area the cottage is located in seems really nice, quiet and safe. I would stay there again. Pleasant stay, comfy beds, cool porch in very hot weather, quiet neighborhood, easy walk to beach. This was a quiet neighborhood, comfortable house and beds, easy walk to beach. A/c would have felt good in such high heat, but several fans were provided and the lanai breeze was very enjoyable. The only table at which to eat was on the lanai or TV tray tables. Kitchen was well equipped and had basic spices/condiments. Comp beach equipment was welcomed and used. We had a digital lock and liked not having to deal with keys. Washer/dryer was a great asset. Perfect place for us, clean, up to date, close to the beach and town! Everything as described only better. Has a yard, great lanai, washer dryer, fans all around. No AC but we wouldn't have used it anyway. The breezes through the house were wonderful. A friendly cat came to visit every day which we loved. Waking up to the morning birdsong the coffee on the lanai was perfect. Beds were really comfy and the kitchen had everything we needed. 9.25% TAT and 4.25% GET Taxes for combined 13.97%. Parties of 4 persons or more rate is $175/nt $150 Cleaning Fee ($250 for >14 night stay) Damage protection is mandatory $69 up to 14 nts, $89 for >14 nt stay Cancellation less than 30 days prior to check-in will be refunded amount paid less $500. Number of visitors is required in the rental agreement. Maximum occupancy is 5 persons TOTAL.